From expanding speedsters to amphibious beach crawlers, these innovative superyacht tenders are much more than meets the eye. 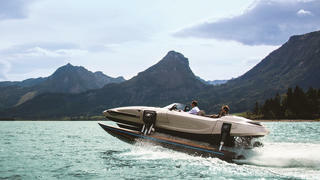 Recently upgraded with a more powerful 900hp engine set-up, the K7 is the first model from Austrian company Kormaran. Capable of cruising in monohull, catamaran and trimaran modes, the 7.1 metre K7 also has retractable foils that allow it to fly above the water. And with a top speed of just under 38 knots, this innovative speed machine is sure to make waves in 2017, with construction of the first sold models already underway in Salzburg. From expanding speedsters to amphibious beach crawlers, these innovative superyacht tenders are much more than meets the eye. 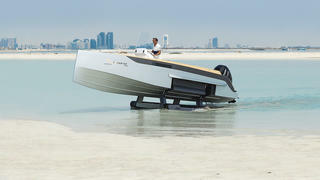 Recently upgraded with a more powerful 900hp engine set-up, the K7 is the first model from Austrian company Kormaran. Capable of cruising in monohull, catamaran and trimaran modes, the 7.1 metre K7 also has retractable foils that allow it to fly above the water. And with a top speed of just under 38 knots, this innovative speed machine is sure to make waves in 2017, with construction of the first sold models already underway in Salzburg. One of the earliest examples of a transforming superyacht tender, the Wider 42 was launched in 2012 and took the boating world by storm with its expanding side sections that can dramatically increase the amount of lounging space when sitting at anchor. Built by the same yard as the innovative transforming Wider 150 superyacht, this 12.8 metre cruiser packs two 480hp Cummins engines for a punchy top speed of 50 knots. If you’re not content with exploring on the water then the Iguana 29 is an ideal choice. With two caterpillar tracks that can deploy from either side of the hull in just two seconds, this 9.25 metre amphibious tender can explore on land as well. A wide range of engine options are available up to a maximum of 400hp and a top speed of 40 knots. Available in the luxury-packed exclusive mode, which adds a generous smattering of gold-plating and leather fittings, the Iguana 29 could make a fine superyacht tender. A smart new transformable superyacht tender from Italy, the Evo 43 was launched in 2015 as the ultimate floating party platform. 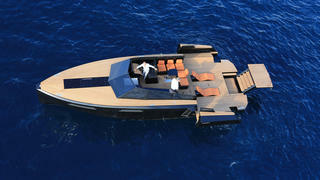 Its expanding side sections stretch out by 90cm to accommodate three multi-position sunloungers. This is as close to a superyacht beach club as you can expect to find on a 13 metre dayboat. 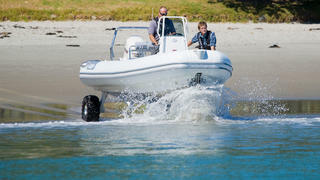 Hailing from Auckland, New Zealand, the Sealegs range of transformable dayboats is so popular that it has inspired its own annual amphibious regatta. 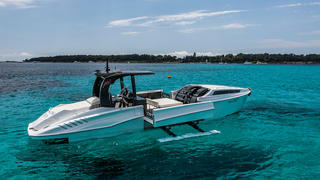 The company currently builds a wide range of models from six to nine metres (including the 7.1m RIB pictured above) which has proved hugely successful, with over 1,000 models sold worldwide, but we are most excited about its recently announced 12.6 metre collaboration with Swedish superyacht tender specialist J-Craft.